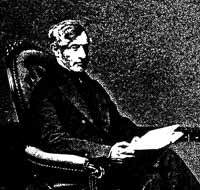 The most famous is Sydney Smith, who was vicar from 1829-1843. His shrewd writings were eagerly read by a wide circle of people, including, it is said. President Abraham Lincoln, while his wit amused even Queen Victoria, we are told. He invented the saying "a square peg in a round hole" and warned that if something wasn't done about Ireland, there would be trouble there in about 100 years time. 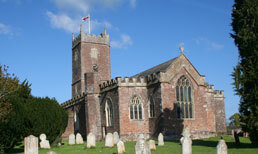 Alas, although Sydney Smith was vicar of Halberton, he did not minister here. He also held the living of Combe Florey, a few miles away in Somerset, where he lived, leaving Halberton in the charge of a curate. Canon Edward Girdlestone was vicar from 1862-1872, during which time he became a nationally known figure because of his fight for better conditions for farm workers. He addressed the British Association, wrote many letters to "The Times" as well as making personal and local representations. Eventually he organised the migration of between 400 and 500 local people to other parts of the country where better paid work was available. In more recent times, W.T.C. 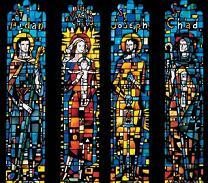 Shapland was a notable stained glass artist. The great west window of Chester Cathedral, some windows in Southwark and Peterborough Cathedrals and many churches throughout the country, and in different parts of the world, are examples of his art. "Tommy" Shapland received all his schooling, from five to fourteen, at the little school at Ash Thomas, in this parish, and there are those who remember him there. He learned his craft at Wippells of Exeter, later becoming an independent craftsman. He died in 1972, at the age of 47.